The Marist College at La Seyne-sur-Mer was acquired by the Marist Fathers in the 1840s. The property dates back to 1621 when it was developed by Captain Michel Tortel as a monastery dedicated to St Francis. In September 1851, Fr Jean-Claude Colin removed Eymard from his position in charge of the Marist novitiate at La Favorite in Lyon. Colin had not been pleased with Eymard’s attempt to seek papal approval for the Third Order of Mary, without having first obtained the authority of his own Superior-General, Jean-Claude Colin. 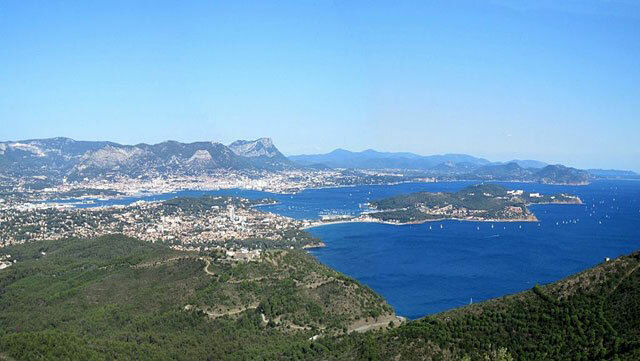 In what may have been an attempt to clip Eymard’s wings, Colin gave Eymard a new role as Superior of the Marist College at La Seyne-sur-Mer near Toulon in the south-east of France. Institution Saint Marie, La Seyne-sur-Mer. At La Seyne, Eymard maintained contact with Marguerite Guillot and often wrote to her about his increasing attraction to the Eucharist. He was aware of receiving intense spiritual insights at particular times. Following one such occasion, which occurred during his prayer after communion on the Feast of St Joseph in April 1853, he wrote to Guillot that he believed that God had placed in his heart ‘a beautiful and noble thought . . . regarding the worship of Jesus in the Most Blessed Sacrament’. He did not elaborate on the nature of this ‘thought’, other than to say that it was both beautiful and terrifying. He told her that he had been encouraged to sacrifice anything for it. He was praying that he might be worthy of it. Although the specific details of Eymard’s experience were not made clear to Guillot in 1853, there seems little doubt that what Eymard was describing to her was an experience of ‘grace’ or a gift from God. His awareness of the importance of God’s love in the Eucharist had deepened and he had understood that he was being personally called to respond to that love. He sensed his human weakness and he prayed that God would help him. In time, Eymard’s response to the call of La Seyne would involve his departure from the Society of Mary and the founding of a new religious order dedicated to the Blessed Sacrament. In 1853, Eymard may have been acutely conscious of his own unworthiness, but he already possessed an extraordinary charism that was obvious to others. One of Eymard’s staff members at La Seyne in the early 1850s was Julian Tenison Woods (1832-89), a brilliant young seminarian and professor of English who later migrated to Australia and became a priest. With Mary MacKillop (now Saint Mary of the Cross MacKillop), Woods co-founded the Sisters of Saint Joseph of the Sacred Heart in South Australia in 1866-7. He also founded the Congregation of the Sisters of Perpetual Adoration in Brisbane, Australia in 1874. 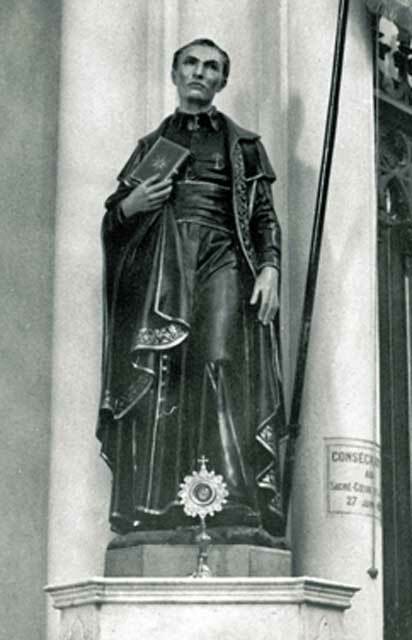 Statue of Fr Peter Julian Eymard, Institution Saint Marie, La Seyne-sur-Mer. Eymard also maintained contact at La Seyne with Raymond de Cuers, who had been ordained a diocesan priest at Marseille in June 1855. Together, they plotted to establish their new religious order and to steer selected Marist aspirants towards its ideals. By May 1855, Eymard had drafted his first set of Constitutions or rules for the projected society and had placed them on the altar at Notre-Dame du Laus. Two months later, in one of those providential meetings that seemed to punctuate Eymard’s life, he was visited at La Seyne by the Oblate priest Fr Jean-Joseph Touche. Decades earlier, when Eymard as a thirteen-year-old was making his second pilgrimage to Laus, Touche had become a friend and spiritual mentor. This time, Touche was on his way to Rome and he offered to take Eymard’s plans for a Society of the Blessed Sacrament to Pope Pius IX. Eymard drafted a petition, setting out his proposals for a special religious order dedicated to ‘the glory and service of Our Lord Jesus Christ in the Eucharist’. He said that, while he had six priests and six students ready to support the ‘eucharistic project’, his superior Father Julien Favre (Jean-Claude Colin’s successor) ‘does not want to favour it outside the Society of Mary’, nor would Favre allow Eymard to work on its behalf without the approval of the pope. Despite the pope’s support for the project, as reported by Touche, it was not enough to convince Favre to let Eymard proceed. Touche, it seems, had a reputation as a somewhat unconventional priest. Favre was probably justified in saying that he would wait to hear the pope’s views from the pope himself. Unfortunately for Eymard, Favre proved to be in no hurry to verify Touche’s report. Soon after these events, Eymard found himself relieved of his duties at La Seyne and posted to the Marist novitiate at Chaintré for a ‘rest’. ‘I suffer and I hope’, Eymard wrote.